“I want to marry a lighthouse keeper. / And live by the side of the sea.” sang Erika Eigan, but according to The Light Between Oceans, the new film from Blue Valentine director Derek Cianfrance, the advice would be: don’t. Michael Fassbender plays Tom Sherbourne, a veteran back from the First World War with a haunted look and a clenched jaw, but all his limbs intact. When the position for lighthouse keeper comes up due to the cabin fever-induced insanity of the last incumbent, Tom applies for the job. A long period free of humanity is exactly what this ruined soul needs to retreat to. At first, Tom takes well to the job. The panoramic views of the seas being thrust on by a relentless wind soothes his mind as he polishes his lamp and keeps his log. However, life intrudes on him one more in the form of Alicia Vikander’s Isabel Graysmark, the lively (for which read ‘giddy’), free-spirited (for which read ‘runs about and does things to service the plot rather than her character’) daughter of the local schoolmaster. She decides to throw her hat at Tom and after a suitably dull exchange of letters, read out in Fassbender’s monotone and giving the audience plenty of time to appreciate their handwriting, they duly marry. Things go well to begin with but after a series of miscarriages grief looks likely to flood them on their island – until a boat arrives carrying a corpse and a baby. As can already be gleaned from the synopsis, this is one heaving bosom shy of a Mills & Boon romance. Cianfrance throws the kitchen sink at it with BBC nature photography, swooping helicopter shots and a constant, constant, constant score be Alexandre Desplat, who also gets credit as a co-producer and deserves to take some credit for the mess. Based on a novel by M.L. 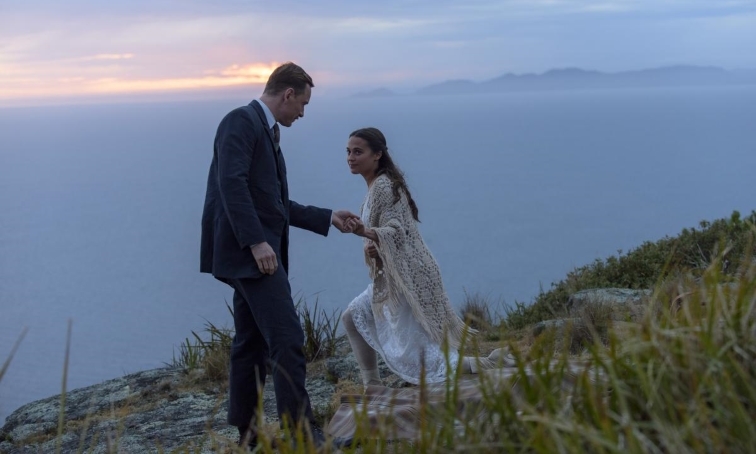 Stedman, perhaps the film can’t help some of the more ludicrous twists and turns and vast improbabilities, but adapted by Cianfrance himself, The Light Between Oceans feels overly tied to ts previous form. The endless letter writing, the little object which will be important later, the exposition-heavy dialogue and the pathetic fallacy all come undone when stretched out on the big screen. Worse still for a work about isolation, there’s no sense of geography. We don’t really know where the lighthouse is in relation to the mainland, nor do we get a real feel for the island itself. The long shots are precisely what Tom wouldn’t be seeing of his situation and actually diffuse the drama into something that looks more like a postcard. Add to this Cianfrance’s overly literal rendering of the title, as the sun is again and again seen in the middle of the frame with the ocean below and the glowering skies above, and everything becomes exasperating. Fassbender is an actor with a solid body of work, but here is at his worse: monotonous, whispery and utterly uninteresting. Vikander has garnered great praise in the past but perhaps to contrast with the stuffed shirt opposite she hams to the point that only David Cameron could appreciate. Rachel Weisz also turns up with her hair a little uncombed, which means she has compelling backstory. There’s no doubt that a lot of talent went into making this flawed piece and there will be an audience for it who don’t particularly care for sense anyway, but given the pedigree of everyone involved this has to go down as more than mere light between oceans but as a the film that fell between two stools. As a lighthouse generally indicates, avoid. The 73rd Venice Film Festival takes place from 31 August-10 September. For coverage, follow this link.